The OTG is perfect for anywhere you go. It is the ultimate in mobile hydration. It is a Tritan bottle, so that means great taste, that will fit in your bike cage. It will fit in most car cup holders, and it will fit into cup holders on most exercise machines. 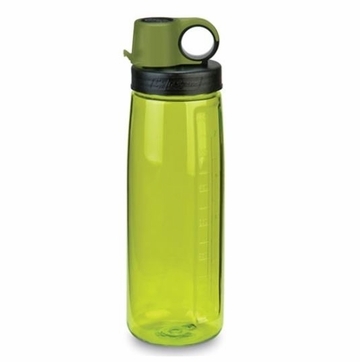 You can flip the top open with one hand for easy drinking, on the go. But, this easy, one-handed access means the OTG cannot be 100% leakproof. Yeah, we know, you have come to expect everything from us to be 100% leakproof. In order to bring you this hybrid bottle that combines the attributes of a standard bike bottle (easy access to your liquids) and our original PC bottle (indestructible, taste and odor free) we were tasked with designing an easy to open lid. So, what we are saying is enjoy the indestructible quality of the bottle, enjoy your liquids without the dreaded plastic taste and smell, enjoy the fact that this quality bottle was manufactured in the USA, but don't put it upside down in your backpack.